Keilir is a beautiful, pyramid-shaped mountain clearly visible from Reykjavík on a clear day. It is not very high, a mere 379 m above sea-level. From a certain point of view on the road between Keflavik and Reykjavík, it looks just like the Cheops pyramid in Egypt, or so they say. Leave Reykjavík following the road to Keflavik and take the turn where the sign points to Keilir. Follow the road through fields of mossy lava (if it is winter, there wont be any moss) until you reach a parking lot and a big sign featuring a detailed map of the area. Follow the path west of the small mountain Oddafell, and take the turn across the lava field towards Keilir. The distance from the parking lot to the base of the mountain is about 3 km. Once you reach the mountain, you follow the trail towards the top. It is rather easy-going to start with, but as you go on the path becomes quite steep at times. It takes about 2 1/2 hours to reach the top. The view from the top is gorgeous, but the wind blows and you dont want to linger too long. You see the steam from the Blue Lagoon, not too far off. 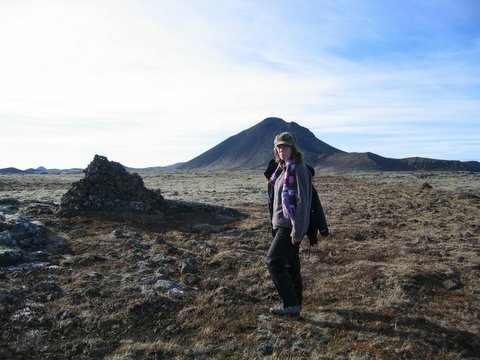 The other site of the Reykjanes peninsula is also worth a visit. Be sure to write your name in the guest-book youll find safely tucked away, and be careful on your way down. We feel more at ease climbing Keilir when the earth is frozen, as the rubble is less slippery in the steep stretches than in dry, warm weather, or when it is raining and muddy. The view from the top is gorgeous on a clear, frosty day.